Used Kyocera FS-2000d Mono Laser Printer. Comes as shown in the picture without toner cartridge. Automatic Duplex Printing (2-sided). Print up to 25ppm (Mono). USB 2.0 & Ethernet connections. Print, Copy, Scan & Fax Functions. We will always go out of our way to source the product you are looking for. 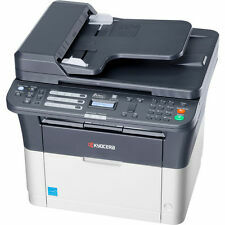 Kyocera Ecosys P2040DN. 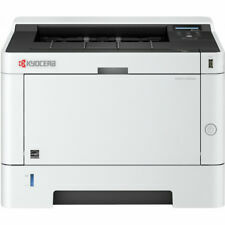 1 x Kyocera Ecosys P2040 DN. Fast Duplex Network Ready Desktop Printer. Compact USB& Network A4 Mono Laser Printer. Up to 40ppm Mono Print. USB, Network. 1200 dpi Print. Warranty ; 6 Months RTB Warranty. Fast Duplex & Network Ready Desktop Printer. Kyocera FS-2100DN. Fast 40 Pages Per MinuteUSB & Ethernet A4 Mono Laser Printer. 1 x Kyocera FS-2100DN. Print Speed: Up to 40 ppm Black. Warranty ; 6 Months RTB Warranty. Up to 45 pages per minute A4 and A5. Exceptionally-low printing costs in its class. Optional paper feeders increase capacity and flexibility. Fast Duplex & Network Ready Desktop Printer. Kyocera FS-4100DN. Fast 45 Pages Per MinuteUSB & Ethernet A4 Mono Laser Printer. 1 x Kyocera FS-4100DN. Print Speed: Up to 45 ppm Black. Warranty ; 6 Months RTB Warranty. 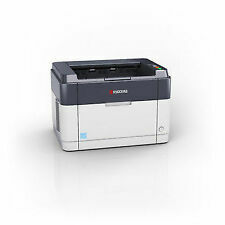 Fast Duplex & Network Ready Desktop Printer. Kyocera FS-4200DN. Fast 50 Pages Per MinuteUSB & Ethernet A4 Mono Laser Printer. 1 x Kyocera FS-4200DN. Up to 50ppm Mono Print. USB & Network. 1200dpi Print. 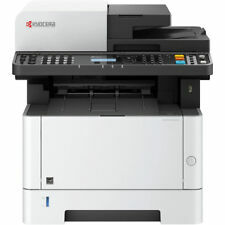 Kyocera M2135dn Printer. Up to 35ppm Mono Print Speed. The box might not be the original and(or) New condition and will have tape or label marks due to tape removal and storage. If you are not happy with the item you received. MPN : ECOSYS M2040dn. Kyocera ECOSYS M2040dn in More Detail. Surprisingly long lasting, despite their modest size, they can print up to 7,200 standard pages of black and white text before needing to be replaced. Fast Duplex Ready Desktop Printer. Kyocera FS-3920DN. Fast 40 Pages Per MinuteUSB Ethernet& Parallel A4 Mono Laser Printer. 1 x Kyocera FS-3920DN. Connectivity: USB, Parallel & Ethernet. Print Speed: Up to 40 ppm Black. Automatic Duplex Printing (2-sided). Print up to 40ppm (Mono). USB & Gigabit Ethernet connections. We will always go out of our way to source the product you are looking for. Automatic Duplex Printing (2-sided). USB,& Parallel connections. Print up to 22ppm (Mono). Add to Favourites. We will always go out of our way to source the product you are looking for. Fast Duplex Network Ready Desktop Printer. Kyocera FS-1370DN. 1 x Kyocera FS-1370dn. USB& NetworkA4 Mono Laser Printer. Print Speed: Up to 35 ppm Black. Warranty ; 6 Months RTB Warranty. Print Speed: Up to 35 ppm Black. Fast Duplex Ready Desktop Printer. Kyocera FS-2020D. USB & Parallel Mono Laser Printer. 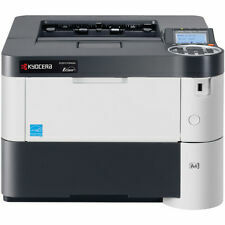 1 x Kyocera FS-2020D. Connectivity: USB & Parallel. Warranty ; 6 Months RTB Warranty. Tested, in good working condition. There are signs of use. Page count 15879 pages. Toner gauge showing about 10% left. FOR COLLECTION ONLY. Printer Type Laser. Connectivity USB, Ethernet. We will either. 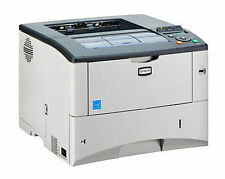 Refurbished Kyocera P-2035D laser printer. 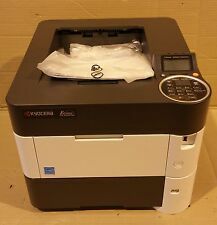 Here we have a nice Kyocera P-2035D printer With 6 months warranty (see below). Automatic Duplex Printing (2-sided). Print up to 35 Pages Per minute. We will always go out of our way to source the product you are looking for. Add to Favourites. Fast Duplex Network Ready Desktop Printer. Kyocera FS-1350DN. USB& Network A4 Mono Laser Printer. 1 x Kyocera FS-1350DN. Print Speed: Up to 30 ppm Black. Warranty ; 6 Months RTB Warranty. Printer Spares specialise in the sale of refurbished printers, parts and accessories. These Printer are our refurbished Printers. Printer Spares UK Limited. •Printer repairs undertaken. Isle of Man : IM, EVC. Fast Duplex Ready Desktop Printer. USB & Parallel A4 Mono Laser Printer. HP Kyocera FS-1020D. 1 x Kyocera FS-1020D. Connectivity: USB & Parallel. Print Speed: Up to 23 ppm Black. Warranty ; 6 Months RTB Warranty. These Printer are our refurbished Printers. •Printer repairs undertaken. 12 £15.00. They are fully tested and working and fully cleaned. •On-site warehousing and logistics. If sold via our usual channels. Automatic Duplex printing (2-sided). USB 2.0 & 10/100/1000 Ethernet connections. Print up to 40ppm. We will always go out of our way to source the product you are looking for. Standard duplex unit for double-sided printing. What Kyocera has to say: -. The new KYOCERA FS-1370DN is a network ready device that gives you the powerful performance you need at the specified speeds. USB & Parallel connections. Add to Favourites. We will always go out of our way to source the product you are looking for. Automatic Duplex printing (2-sided). USB 2.0 & Ethernet connections. Print up to 45ppm. We will always go out of our way to source the product you are looking for. Fast Duplex Ready Desktop Printer. Kyocera FS-4020DN. Fast 45 Pages Per MinuteUSB Ethernet& Parallel A4 Mono Laser Printer. 1 x Kyocera FS-4020DN. Up to 45ppm Mono Print. USB, Network & Parallel. PCL6/PCL5c incl. Kyocera FS-2020D Mono Duplex Laser Printer - Used. Paper capacity of up to 1,100 sheets with optional paper feeder. Standard duplex unit for double-sided printing. USB and parallel connectivity as standard, optional network. Automatic Duplex Printing (2-sided). Print up to 30ppm (Mono). USB 2.0 & Ethernet connections. Print, Copy, Scan & Fax Functions. We will always go out of our way to source the product you are looking for. As such, the cost per page for this little beauty is astonishingly low. You can breeze through your printing safe in the knowledge it's costing you as little as possible, without compromising on quality. Part : 1102NC3NL0. The Printer Broker Ltd is a supplier of printers, fusers and printer parts based in Bolton, Greater Manchester, UK. Page Count: 937. 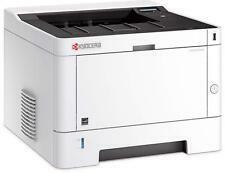 Kyocera ECOSYS P2040dn Mono Printer. 2-year warranty as standard. Up to 40ppm Mono Print. 2 Line LCD Backlit Display. The box might not be the original and(or) New condition and will have tape or label marks due to tape removal and storage. Refurbished Kyocera FS-1120D laser printer. 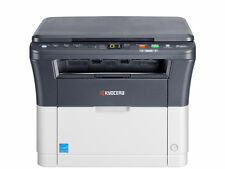 Here we have a nice Kyocera FS-1120D printer With 6 months warranty (see below). It has a built-in ethernet port so you can connect directly to your network. It also has a USB port and a Parallel port if you want to install it that way. The unit shows the toner level at 100% as you can see from one of the pictures. Kyocera FS-2000D. USB & Parallel Ready A4 Mono Laser Printer. Fast Duplex Ready Desktop Printer. Warranty ; 6 Months RTB Warranty. Print Speed: Up to 30 ppm Black. Connectivity: USB & Parallel. 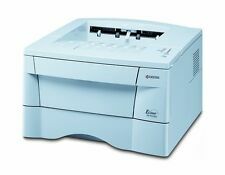 LaserJet A4 Mono Multifunction Laser Printer. Ky ocera FS-1118 MFP. Fast 18PPM Mono Printer Copier Scanner. Up to 18ppm Mono Print. Fast Network, Parallel & USB Ready Workgroup Printer. PCL6/PCL5e incl. Type: Printer. Ink type: Laser. Connectivity: USB. 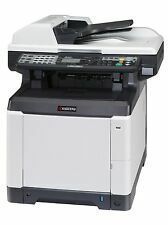 Kyocera FS-2100DN A4 Mono Laser Printer, Very Low Page Count, WARRANTY!